The 15 Coolest Coffee Shops in Missouri! 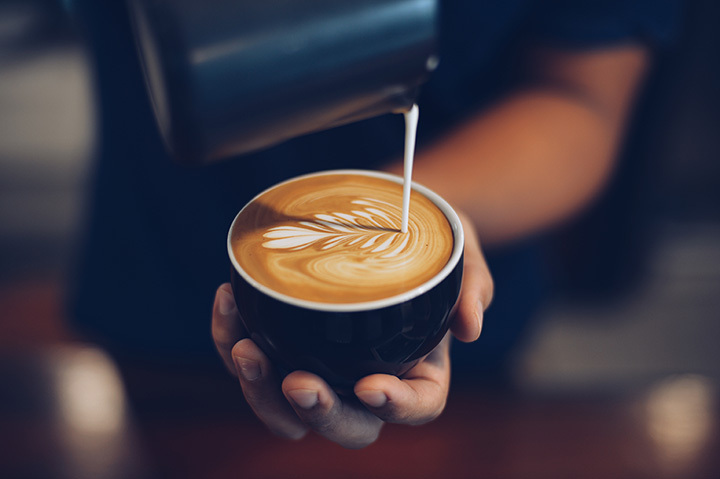 From cozy, urban-setting shops with hip vibes to suburban spaces that let you get away from it all, Missouri is home to an eclectic range of coffee places. These Missouri coffee shops value a strong connection to their community and value giving their customers top-quality brews. Here are our 10 favorite coffee shops in Missouri. Westport Coffee House bills itself as an “honest neighborhood café,” where people can “meet, have a conversation, and sit down to a stellar cup of coffee.” The coffee house is located over the W.C.H. Theater, making it possible for patrons to grab a drink and then head downstairs for some improv or live music. A full menu of coffee drinks and baked goods make this a great place to spend an evening. This comfortable coffee shop in downtown Hollister is the perfect place to spend a Saturday afternoon. Hand-roasted specialty coffees, organic teas, fine wines, craft beers, cigars, and local pastries serve to make this a destination eatery in southwest Missouri. On warm summer evenings, head outside for a cup on the patio, and on cooler ones, sit indoors and enjoy classic literature from the small in-store library. Cup ‘n Cork in Cape Girardeau’s historic downtown district has a warm, contemporary vibe, making it a great place to meet friends and catch up on the local news. Specializing in gourmet coffees, Cup ‘n Cork also offers an extensive collection of fine wines and a full menu. They offer various social events such as Open Art Studio, open mic nights, live music, and even screenings of classics films. Living Room Coffee & Kitchen serves a variety of scratch made baked goods, boasts a full breakfast and lunch menu, and sells exclusively ArtHouse Coffees. Unique coffees cultivated from single estates showcase a wide variety of textures and flavors. Drop in for a famous “burnt orange latte,” or a single estate tea from Spirit Teas. Picasso’s Coffee House, tucked away in the heart of historic St. Charles, prides itself on positive relationships with the community, supporting several local charities and arts programs. But it’s the coffee that draws people in—delicious micro-roasted coffees roasted right in St. Louis. A full menu of pastries and other goodies makes Picasso’s a great place to meet, listen to live music, view the exhibits of original art, and share a common experience. This park-side coffee house, known to locals as “the Spiral,” is the ideal spot to read, study, or meet up with friends. The Spiral offers great coffee, as well as a variety of breakfast and lunch items, and the eclectic décor is an inspiring atmosphere for poets, writer, artists, and musicians. The Spiral also offers an upstairs party/meeting room, and frequent exhibits by local artists. Come in, grab a table, and create your masterpiece over a great cup of coffee! A quirky coffee shop in downtown Springfield, the Mudhouse has been offering their own roasted blends for almost 20 years. The Mudhouse also offers daily featured drinks to give regular patrons a chance to try new, interesting, and delicious new brews. Pair a cup with a fresh baked pastry or delicious homemade soup, then sit down in one of the overstuffed chairs and relax the morning away. Hazels Gourmet Coffee & Tea Company is a great place to stop on your way through St. Joseph. In fact, many travelers make a point of getting off the highway just to get a cup of Hazels. Offering a wide variety of coffee drinks and baked goods, the atmosphere reminds one of an old-fashioned coffee shop, and lends itself to artistic endeavors, reading a good book, or having a conversation. Be sure to check out the selection of gifts, as well. A family-owned operation on the northern edge of the Ozarks, Keen Bean offers “a full line of espresso drinks, chai, cold brew and freshly roasted batch brewed coffee,” according to their website. The coffeehouse is cozy, using mostly natural light from the high windows, and is perfect for hanging out or writing your next novel. Original artworks by local artists hangs on all the walls, and local musicians play on the weekends. The staff is courteous and the owners are on-site and knowledgeable. Kate’s Coffee House is in a beautifully restored house on the grounds of the Oaks Crossing Conference & Banquet Center in historic Augusta. Augusta is in the heart of Missouri Wine Country, but Kate’s serves a full menu of cappuccinos, espressos, and lattes. Hikers on the nearby Katy Trail would do well to stop in for a cup before heading on their way. Oddly Correct bills itself as “extraordinary coffee to freak out your morning cup,” and prides itself on producing “mind-opening specialty coffees.” The urban vibe and exotic artwork serve as backdrop to a truly extraordinary cup of coffee. Oddly Correct also delivers by bicycle to patrons who live in the distinctive Westport neighborhood of Kansas City. This family-owned business in Missouri’s lake country has the feel of a general store, with oak shelves and glass-enclosed cases that have been saved from being thrown out, because the owner can’t stand for beautiful things to be tossed just because they’re old. Coffee and espresso is made on the spot, and there’s plenty to look at while you’re here. Sit by the fire for a while, or let the kids play in the toy room. City Coffeehouse & Crêperie is a European style coffeehouse, serving an expansive selection of crepes for breakfast, lunch and brunch, along with a full menu of espresso drinks. Traditional crepes are served indoors or street side, and the coffee is delicious as well. Especially look for the Alpaccino, the restaurant’s version of a frozen mocha. This coffeehouse, just a few minutes north of downtown Kansas City, partners with importers to find sustainably farmed organic and fair trade beans. Coffee is roasted in small batches, and the baristas are knowledgeable and friendly. Check out the coffee alternatives, as well. Parengo Coffee, which started on a back porch in 2012, has now grown into the premier craft coffee shop and roaster in Southeast Missouri. Parengo’s offers espresso drinks, drip coffee, and a variety of teas. Local artwork, comfortable seating, and chill music make this a great place to hang out in downtown Sikeston.